Formula One has always been about one thing: To be the world’s largest racing series where up and coming technologies can be previewed, developed, and tested before eventually funneling down into everyday production cars. However, tracing the history of Formula One has always been a challenge. Until now. Thanks to the creative mind of Ruf Blacklock, we can now see the 62 year history of Formula One compressed into a short, yet extremely sweet, 60 second video. Showcasing basic 3D outlines of the vast majority of F1 designs, the video helps to capture the rapid changes which the series has undergone in the past six decades, with major advancements including the addition of rear wings, and the varying capacity of engines also been demonstrated throughout. 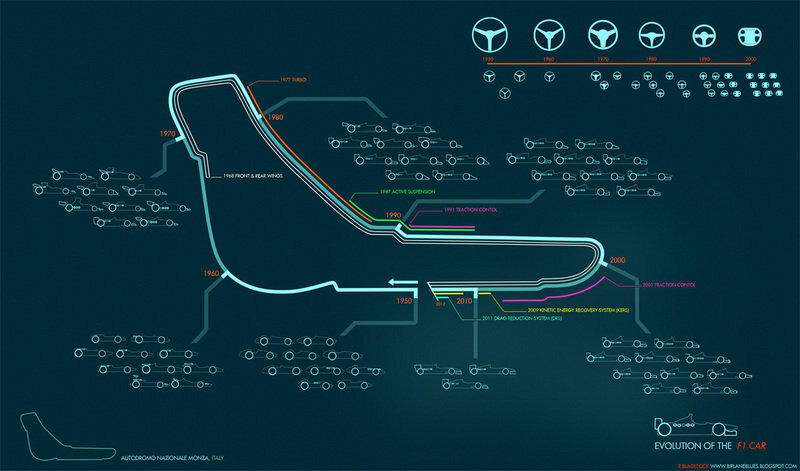 In addition to this, Blacklock also put together an awesome infographic for our enjoyment capturing the development of Formula One, with the legendary Monza circuit being the basis for this extensive circle of F1 development. Follow the jump to see the infographic in high-definition!